Hitachi Introduces Innovative Small Character Printer : News Releases : Hitachi America, Ltd.
TARRYTOWN, NY, August 16, 2004-- Hitachi America, Ltd., Power and Industrial Division, today introduced the world’s most advanced small character inkjet printer. 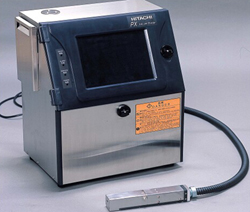 Hitachi has been building small character inkjet printers since 1975. The PX Series has been designed to provide the best price-point feature to feature. The PX Series deploys a 10.4” large Color LCD Touch Panel with full guidance on the screen providing easy and quick operation and maintenance. The PX Series’ unique and innovative ink circulation system helps reduce fluid evaporation and achieves a very low cost of operation. Nozzle and gutter are automatically cleaned before shut down, so no special procedures are required. PX Series viscosity and density control provides stable ink drop formation and keeps print quality high. IP55 with sanitary anti-bacterial stainless steel provides full protection against dust and water. For further information contact Hitachi at inkjetprinters@hal.hitachi.com. Or visit us online at www.hitachi.us/ijp. To learn more, please visit Hitachi at PACK EXPO International November 7-11, 2004, McCormick Place, Chicago, IL.